Housing numbers were just released and the message seems to be that the market is finally starting to reflect reality (at least with regards to housing starts). 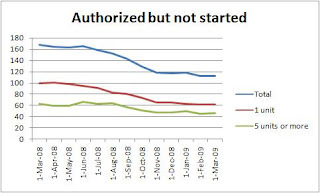 As you can see below, the "Authorized but not started" numbers are finally coming down - this reflects the gap between the market's leading demand expectations vs. actual demand and it is a good sign that the number has been decreasing especially in the 5 units or more category. "Housing started" numbers are roughly halved on a YoY basis but we still think there is room to fall on this as housing inventory months continue to increase. 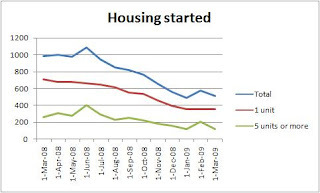 As David Rosenberg pointed out, even if housing starts fell to zero it will be a few years before housing prices stabilize; on that basis, it still seems prudent to see housing starts remain weak, if not dip down a bit more. 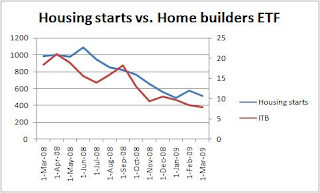 As you would expect, home builders are taking it on the chin. Below, we track housing starts vs. the home builder ETF (ITB); even though it's an already low level, we don't see much hope for home builders going forward on a 6 month time frame. Overall, it is a good sign that the housing market is closer to reflecting reality and should help alleviate some of the price pressure that we have been seeing, especially in the foreclosure market. However, we want to caution that this is far from a bottom; housing continues to be along for the ride and until household balance sheets clear up, it is likely to plod along supplied only by minimal demographic-driven demand.